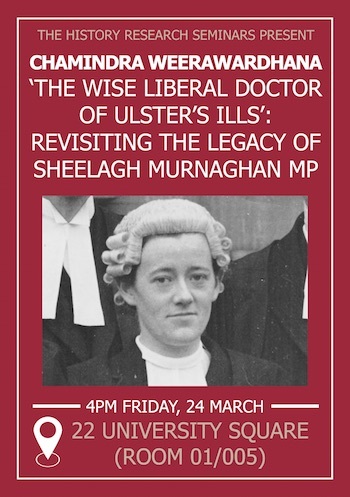 Sheelagh Murnaghan LLB MP OBE (1924-1993) was the first practising female barrister in the Belfast bar. An international sportswoman, she also captained the Irish national hockey team. In 1961, she was elected to the Northern Ireland House of Commons, from the Queen’s University constituency. A tireless gender and social justice advocate, Ms Murnaghan was the first ever politician in Northern Ireland to highlight the necessity of human rights legislation for the province. At four different occasions, she tabled four human rights bills at the House of Commons (bills she drafted all by herself), which were summarily defeated by the majority Unionist government. Most often, historians pay scant attention to pioneering women in politics and in the judiciary, and in many existing narratives, Sheelagh Murnaghan receives all but scant attention. This talk is based on an ongoing research project that seeks to ensure Sheelagh Murnaghan’s premier place in socio-political debates in Northern Ireland (and indeed beyond). The speaker, Dr Chamindra Weerawardhana, is a Research Fellow at the Centre for the Study of Ethnic Conflict at Queen’s University Belfast, board member of Sibéal, the Irish Feminist and Gender Studies Network. and an Executive Committee member of the Labour Party in Northern Ireland, where she is also the LGBTQI Officer.